I'm not quite sure what happened. I was listening to music when all of a sudden the sound stopped. Windows Media Player seemed to still be playing my music so I know I hadn't paused it or closed it down by accident. First I checked my speakers. I could see they still had power because the green power light was visible. I switched them off and on again but no sound. I also turned the volume button to maximum in case I had turned it down. No joy. I then checked the volume on my computer. Mute wasn't enabled and the volume had not been turned down here either. I didn't know what else to do so I restarted my computer. My sound worked fine after that, and has worked fine ever since. I was intrigued as to why it failed in the first place and come across your page in my research. Do you have any suggestions as to what the problem could have been? Hello Derrick. Thank you for taking the time to write your own web page. It looks to me like the issue is/was with your Sound Card Driver. 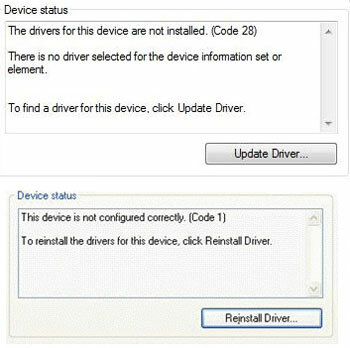 If this issue re-occurs go to your Device Manager and look for 'Sound Video and Game Controllers'. It is likely you will see a 'Yellow Exclamation Mark' on your sound card driver – indicating a problem of some sort. Even if it doesn't have an exclamation mark, double click your Sound Card device driver to look at the Status. Does the status say 'This device is working properly'? If it does then we are looking at another problem. However, if you have a status, as suspected, like the ones in the image above, for example, then you have a driver-related problem to be fixed. The chances are this issue will re-occur. A reboot will re-load the drivers and they maybe be stable for a while. Ultimately I think you need to source the latest drivers and update or re-install them. Take a look through the rest of the tutorial on sound cards to learn how to install device drivers and other troubleshooting techniques. Join in and write your own page! It's easy to do. How? Simply click here to return to Sound Card Not Working.